Sharon has a degree in agricultural business and has been with Amherst Veterinary Hospital since 1998. Her compassion and caring for animals began at a young age while growing up on her parents dairy farm. In her spare time, she enjoys travel and volunteering as a 4-H Cloverbud leader for her daughter's 4-H club. She shares her household with her husband Dan and daughter Skyler, as well as their cats Jingles & Poofles of Linwood the First. Chandra has been with the Amherst Veterinary Hospital since 2004. She attended a few different colleges before finding her calling as a Certified Veterinary Technician. She is certified in both abdominal and echo cardiac ultrasounds. She attended Argosy University in Eagan, MN and graduated in 2009. She has 5 cats Kidder, Tig Tig, Skeezik, Tootie and Shippird. She also has a boxer named Mater and 2 horses: Bud & Inness. Jenny has been with the Amherst Veterinary Hospital since 2005. She loves spending time with family, friends & her pets. She is an outdoor enthusiast who spends most free time participating in activities like trail running, hiking, bird watching, nature photography and enjoys volunteering. She and her husband Ryan and son Carter have 4 cats named: Nitnit , Monkey Skunks, Potter and Squickles Velorum. 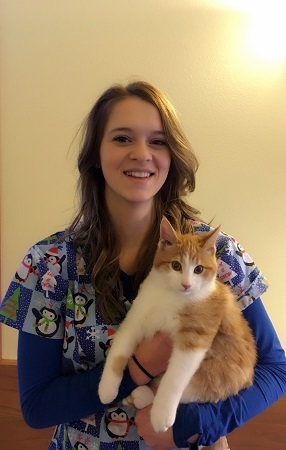 Hannah has been with Amherst Veterinary Hospital since 2013. She graduated High School in 2015 and is attending UWSP with a pre-veterinary emphasis. She has six dogs named Riggins, Bonnie, Ruby, Oliver, Chip and Dixie as well as 5 cats Liberty, Belle, Studs, Jerry and Norris. She enjoys riding horses and participating in FFA events. She has an Arabian horse named Annie and 3 Quarter horses named Gator and Miss Kitty & Baby. She also has 2 goats named Puff & Reagan, and 2 pot belly pigs named Bert & Ernie, and a chicken named Catherine. 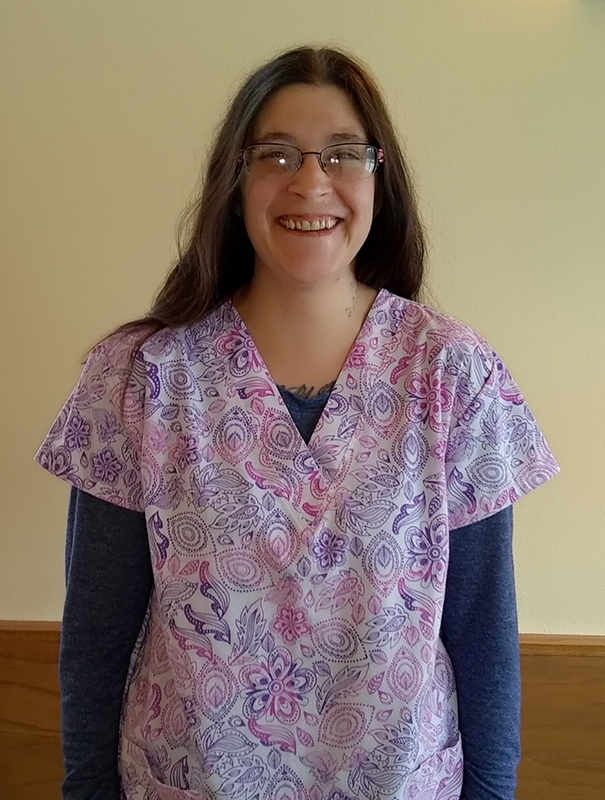 Mara has been with Amherst Veterinary Hospital since 2017. She graduated high school in 2015 and now attends UWSP with a pre-veterinary emphasis. She is from St. Louis Park, MN and moved to Stevens Point to attend college. She has 3 cats named Teddy, Max and their newest addition King George the Serene first of his name slayer of men and dragons. She also has 2 Rabbits named Edna and Norbert. She likes to make pottery and bake in her free time. Sarah has been with Amherst Veterinary Hospital since 2014. Sarah loves to travel and has lived in Colorado, Florida, Kansas, Mississippi, Louisiana, Texas, Minnesota and currently resides in Wisconsin. She graduated in 2011 from Animal Behavior College with a certification in canine behavior and training. She has been married since 2009 and has 2 adorable little girls named Jasmine and Madison. She also has 3 cats named Junior and Hair Pig and Bristol a.k.a. Monsta Cat and 2 dogs named Miranda and Sadie. 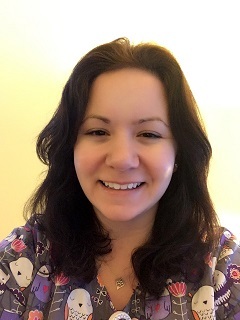 Amanda has been with Amherst Veterinary Hospital since 2014. 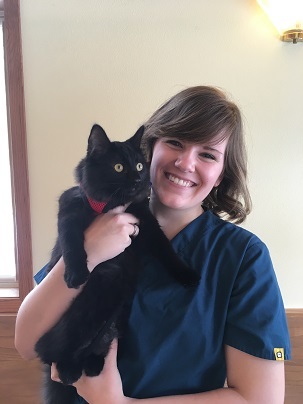 Amanda graduated from MATC Madison in 2010 and worked as a Certified Veterinary Technician (CVT) at a clinic in Madison for 4 years before joining our team. She recently became certified in both abdominal and echo cardiac ultrasounds. She enjoys camping, fishing, and being outdoors. She has a German Shorthaired Pointer named Diesel, a Rottweiler named Axel, two Shih Tzus named Cali & Shorty and 5 cats named Joshua, Winston, Chevy and 2 kittens named Memphis and Jackson. She also has a pot belly pig named Pickles along with many chickens and a rooster named G'it.